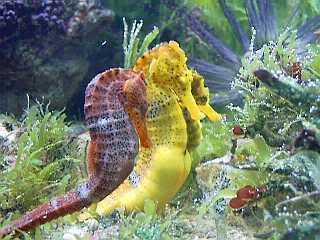 Seahorses have fascinated man for generations with their beauty and graceful lifestyle as they gently go about their business in the sea world. They are truly magnificent creatures so it is no surprise that many fish keepers at some time or another decide to have a go at setting up an aquarium to keep them in their homes. Unfortunately they are not the hardiest of fish and this can lead to many heartaches when they seem to pass away for no reason, this is normally due to them being kept in the wrong conditions so hopefully this article will shed some light on keeping the seahorses for their full life and their keepers seeing them behave as they would in the wild. They have an amazing ability of being able to change their colouration to suit and their tails grip to the aquarium décor allowing them to rest and observe all around them, they swim in a graceful manner and have the cutest of faces. Seahorses need space and excellent water quality, do not attempt to keep these creatures unless you are prepared to dedicate time to look after them properly and perform regular water changes as required and spend time maintaining your aquarium to keep it all running efficiently. The minimum tank size for a couple of seahorses is 40 litres, remember it can be more difficult to keep stable water conditions with smaller tanks, often the best choice is to go for a larger aquarium, this will male tank maintenance easier and also allow you to keep more stock and add more décor etc. Gravel should be used for the substrate, there is no need to add a thick layer, keeping the substrate down to an inch for example will help to keep it clean when you apply a gravel vacuum. Make sure that the gravel size is not too small, the seahorses may search through the substrate for particles of food and can easily swallow the gravel if the pieces are too small. Use a quality marine salt and preferably RO water to mix it in. Aim to get the SG to 1.022 using a reliable hydrometer or refractometer to check before adding to the tank. Add a reliable aquarium heater and set the water temperature to 23-25 deg C for tropical seahorses, temperate seahorses will require a slightly lower temperature and add either a power head for water movement and use an external filter for filtration or use an internal filter dependant on the aquarium size. Décor for the aquarium can include artificial plants or even some of the marine algal plants, the important thing is to provide somewhere for the seahorses to latch onto with their tails. Other décor could include some rocks, artificial corals etc., it is not recommended to use real corals as they prefer higher temperatures than the seahorses are comfortable with. 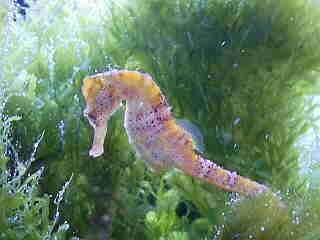 Never add the seahorses to an uncycled tank, the water must be tested to ensure that a full cycle has completed. The ammonia and nitrite readings must be at zero and nitrates must be kept at a level below 10 ppm. Test your water on a weekly basis and f the nitrates are creeping too high, perform a larger water change to reduce them. Normal water changes should be set at 10% weekly, do not cut corners and miss these out or your water parameters can take a dive for the worst. Suitable tank mates are basically any peaceful species of fish that are not too large. Many of the gobies, mandarin fish, scooter blennies and suchlike, the most obvious tank mates being other pipe-fish. As expected the Seahorses may be a bit reluctant to feed when they are first added to the tank, they will eat with patience and require meaty foods such as brine shrimp or Mysis. Try not to overfeed, give less on the first few meals and gradually build them up once you learn how much your Seahorses actually require. It is far better to feed them two small meals per day rather than one large one. Feeding smaller meals gives the Seahorses the chance to digest their food properly and limits the chances of uneaten food staying in the tank. You may find it easier to target feed the Seahorses using a turkey baster, this is especially true if their tank mates are first in the queue with every meal. 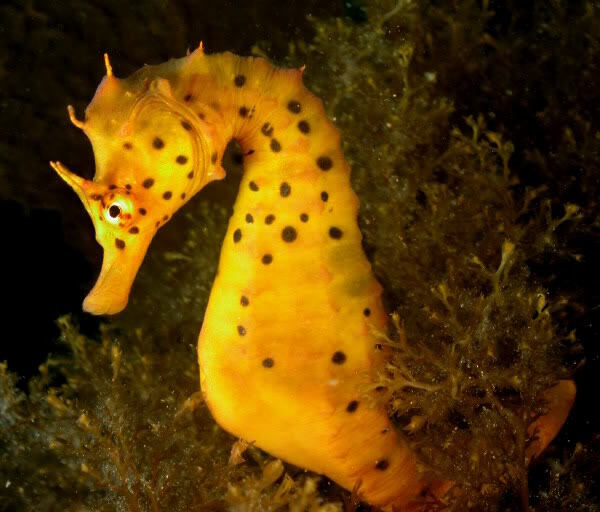 Many people are under the impression that breeding the Seahorse can be an easy task, the mating and spawning is not all that difficult but raising the young seahorses can be a different matter, it is at this stage that many keepers get disillusioned as they are extremely difficult to raise. The young seahorses will only accept live food, newly hatched brine shrimp seems to be the most popular method so hatching these is a vital part of your success, be prepared to have food on hand when the young are ready to eat. Observing the mating of the Seahorses really is something to witness, the male approaches the female and rests next to her and then he will quiver at the same time puffing out his pouch. If the female is ready to mate, she will also quiver and they will then rise into the water column, sometimes linking tails ready for the next stage. Expect to see many changes of colouration as they both get prepared and when the time is right the female will deposit her eggs into the pouch of the male, he will then squirm about so that the eggs can make their way into a special cavity where they will gestate for anything up to 3 weeks. During this time the males pouch will seal itself closed until it is time for the birth. This normally takes place in the morning and the male will wriggle and rub himself against the tank décor to get the fry to leave the pouch. This is now a good time to move the parent fish to another tank so that only the fry remain, their feeding regime should not be disturbed. If you wish to move the fry always use a cup or similar, they must never leave the protection of the water, keep their tank simple and use an air driven sponge filter so that the tank remains calm. The fry do not have the capability of storing food so will need regular feeds, only feed them what they can consume and any uneaten food needs to be syphoned from the tank. The water parameters must be pristine so regular water changes are a must but always add back water with the same parameters as any change can be lethal. Once the fry actually accept the food, the largest battle is over and they should grow steadily until they accept the same diet as their parents.